I’ve started using one of my old rarely-used moleskines as a new sketch journal/scrapbook of sorts. I used to make collages inside of notebooks, but now am starting to incorporate a bit of hand-drawn art into the mix. This is partly inspired by Emma as the other week she showed me her sketchbook in person and it was amazing. 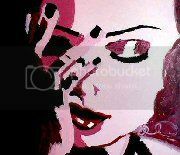 I’m not an illustrator like her, so I am doing my own thing. Also, I now have suddenly a use for those piles of postcards, stickers and other memorabilia from my past. 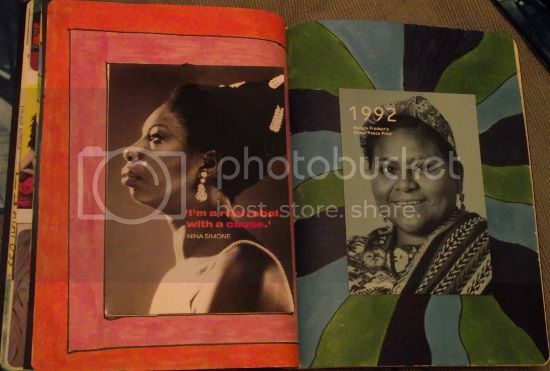 These pages are dedicated to two women I admire – the Nina Simone card is a 30th birthday card from my friend Michelle, and I bought the Rigoberta Menchu postcard at the Nobel Peace Centre in Oslo, Norway. Rigoberta won the Nobel Peace Prize in 1992. This entry was posted in scrapbooks / sketch journal by Christina. Bookmark the permalink.